November 2011 I lost my wonderful dog Bo. Bo was a rescued dog booked for euthanasia. 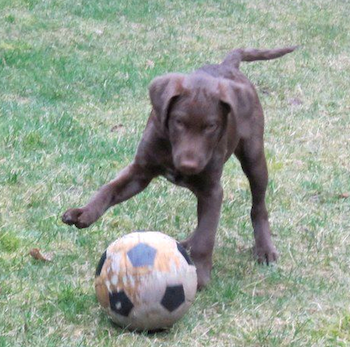 He was part Chesapeake, part Weimaraner, all loving heart. Christmas was lonely without a dog in the house. 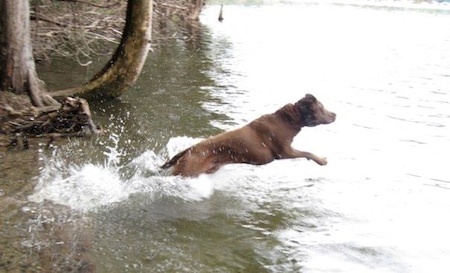 Although Bo was irreplaceable, I knew I had to have another dog and I knew that dog had to be a Chessie. 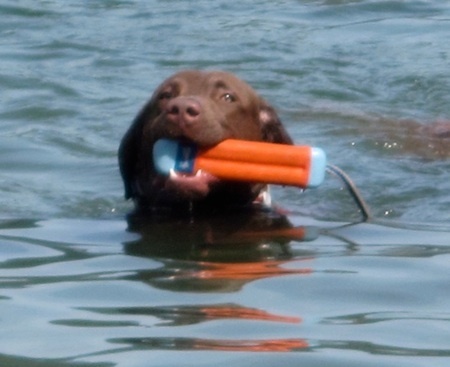 For those unfamiliar with a Chesapeake Bay Retriever, they look sort of like a chocolate lab but get bigger and more muscular. They are full of wonderful characteristics (loyalty, hard working, protective), but like every breed, also have a couple of challenging traits. 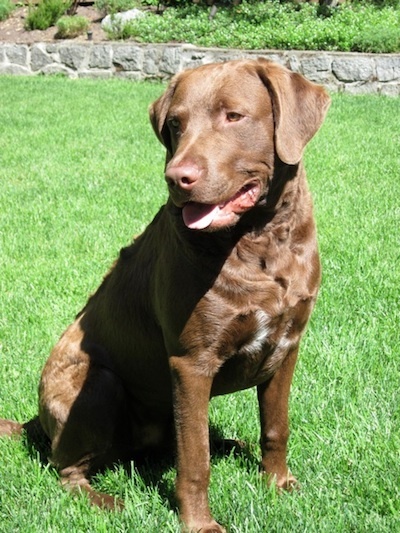 There is an anonymous quote that says “You can order a Lab, ask a Golden, but you must negotiate with a Chesapeake”. They can be strong willed and stubborn. Hunter joined our family at the end of January 2012. Full of fuzzy brown cuteness. He was just 8 weeks old when we brought him home. One week later he would start coming to work with me. The plan is to train him to be a therapy dog, working with clients having both mental health and addiction illnesses. The atmosphere can get pretty intense and my little guy would have to be great socially and obedient. Here I was with a sweet little puppy, who had a a strong willed, stubborn, dominant nature and would soon out weigh and out muscle me. He also needed to start training as a therapy dog in an intense atmosphere. Good obedience training and socialization was not an option, it was a necessity. I contacted several people/companies offering obedience training. Checked out a few places, and waited for others to contact me back regarding their training programs. When I contacted Jeff at Sit Happens, I received a really fast response (waited up to 2 weeks to hear back from a few others). Before the week was out, Marilyn was at our home for a consultation/demonstration.Already I was pretty impressed with their professionalism. The amazing Flirt (Marilyn’s Papillon) gave us a great demonstration of how well a dog can work, even with distractions like squeaky balls. Marilyn gave us a few tips on some things to work on with Hunter and left us to mull things over. Our discussion to sign up with Sit Happens went something like this….me – I think we should sign up with Sit Happens, Richard – yep, when can we start. Took about 30 seconds after Marilyn had left. Hunter was still pretty young and needed to have his second set of vaccinations. He could not start the open obedience classes, but Marilyn came out twice to do some private sessions. He was already showing improvements, listening better and stopped demonstrating his dominant nature (at least with us). At 11 weeks old (almost 3 months old), Hunter joined his first obedience class. In just a few months, Hunter and I have done great together. When Hunter was 5 months old, we took him to a senior’s retirement home for a visit. They were serving a special Mother’s Day brunch in the lobby. Although his nose was in the air and twitching at all the yummy smells (mmmm bacon), Hunter stayed at a heel by my side, never once tripping up the servers in hopes of stealing some deliciousness. Later, he sat quietly in the lobby with me, happily receiving attention from staff and residents. At 7 months, Hunter had another big test. He joined us on vacation in Whistler. I received so many complements from hotel staff and visitors regarding his great behavior. People were even more surprised when they discovered he was only 7 months old. Every day we walked different trails. Except for in the village or in the hotel, Hunter was off leash the entire time. Whenever bikes or joggers came by, I would point to an area off the trail, and tell Hunter to sit. Even if he was ahead of me, Hunter would immediately move off to the side and sit until I said his release word. Received many a grateful thank you as the bikers rode by. No bikes or joggers were chased. Late summer we did a tricks class run by Marilyn called Show Off. Hunter and I had great fun doing this class – jumping, weaving, bowing. Gave me a new way to entertain the clients at work as well as new ways to stimulate Hunter’s brain and increase our bond. Recently we started a new skills development opportunity offered by Sit Happens – Nose Works.Wow! does Hunter ever love doing this. In Nose Works, Hunter is learning to find a hidden scent. We start by putting a harness on Hunter which lets him know it is time to work. He gets so excited and wiggly when he sees the harness that it can be a little difficult getting it on him. Once the harness is on, he puts on his focus and concentration face waiting for the command to find the hidden scent. Hmmm, maybe I should train him to find those missing keys or phones? After a Nose Work session he is so tired from all that brain work that he is ready for a nap. Hunter is doing great at work. The clients have loved watching him grow and mature over that last few months. He happily entertains staff and clients with some of his new tricks like spinning and bowing. He has started spending some one on one time with clients. It was so cool when Hunter became a “prescription”. One of our clients really started opening up with the care team and building a therapeutic relationship after spending some time with Hunter. The physician recognized this and ordered ongoing “Hunter time” for this client as well as a couple of others. Animals can reach our clients in ways that medications and other therapies can’t. 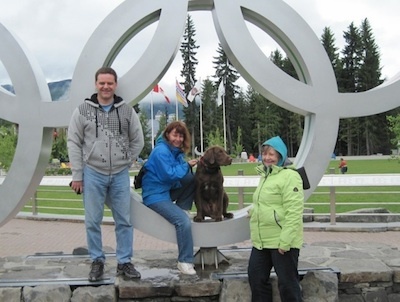 Jeff and Marilyn have not only taught us both the basic obedience work, but have also advised with other things as they crop up. Teaching Hunter to swim took a little work, but by following some of Marilyn’s tips, we soon had our boy happily playing in the water. Hunter may not be perfect, but then neither am I. He still has some maturing to do and things do happen – like stealing Christmas presents from under the tree (at least they were his), or sneaking a tempting bite of something when the people are distracted (Richard still sheds a tear for the lost piece of steak). But when problems arise I can contact Jeff and Marilyn for advice on how to work on the issue. Throughout all the training, Hunter has remained a happy, playful puppy. I think he has learned that the more he listens and obeys, the more freedom he gets. After about 10 months of training, I have a young dog that walks well on and off leash, comes when I call (even though chasing that other dog or ball sure is tempting), will quickly settle even when going through the crazies, will wait for his dinner and not touch it until told, give up the ball after fetching it and many other things. I don’t have to bribe him with treats, nor is he ever afraid he will get smacked or punished. Sometimes I may still have to “negotiate” with Hunter (we can’t do the fun stuff until your harness or leash is on) – but that is the Chessie way, and I always win the negotiations. Thank you Jeff and Marilyn for teaching me the tools to do this work with Hunter. Not only does Sit Happen but so do a lot of other great things.